JUNEAU, Alaska, April 8, 2011 (ENS) – Two areas of Alaska’s Cook Inlet will be designated as critical habitat for the endangered Cook Inlet beluga whale, NOAA’s Fisheries Service, Alaska Regional Office announced today. The critical habitat designation encompasses 3,016 square miles of marine and estuarine environments considered by scientists to be essential for the whales’ survival. Today’s rule finalizes critical habitat first proposed by the Fisheries Service in December 2009, following a notice of intent to sue by the nonprofit Center for Biological Diversity. 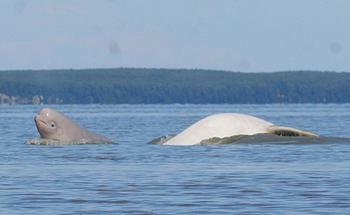 Scientists estimate there are just 321 Cook Inlet beluga whales left in the wild, down from 1,300 counted in the past. This distinct population segment was listed as endangered under the federal Endangered Species Act in October 2008. Required under the Endangered Species Act, the critical habitat designation affects those activities that involve a federal permit, license or funding, such as construction and operation of oil rigs, port construction, dredging, or discharges into Cook Inlet that must be authorized by the U.S. Environmental Protection Agency. The Center and other organizations are currently defending the Fisheries Service in a lawsuit brought by the state of Alaska that challenges the listing of Cook Inlet belugas under the Endangered Species Act. Trustees for Alaska represents Alaska Center for the Environment, the Center for Biological Diversity, Cook Inletkeeper, Defenders of Wildlife, Natural Resources Defense Council and North Gulf Oceanic Society as interveners in Alaska’s lawsuit. Cook Inlet belugas form a genetically distinct and geographically isolated group of belugas whose numbers have plummeted in recent years. The Fisheries Service’s decision to list Cook Inlet belugas as endangered was supported by every government and agency scientist who weighed in on the issue. The habitat designated as critical covers feeding areas near the mouths of salmon streams, but not all of the current range of these white whales was designated as critical habitat. 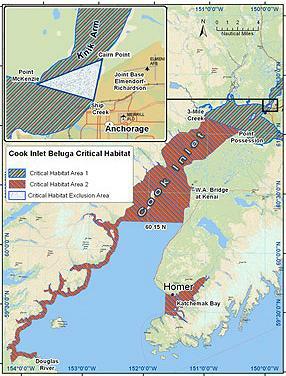 One designated area includes the upper portions of Cook Inlet, Turnagain Arm and Knik Arm where belugas concentrate in summer months. The other area includes areas where the whales congregate in the winter – the middle of Cook Inlet, foraging areas along the western shore of lower Cook Inlet, and Kachemak Bay along the eastern shore of Cook Inlet near the town of Homer. NOAA’s Fisheries Service has excluded the Port of Anchorage from the critical habitat designation because of its importance to national security. The agency excluded the Eagle River Flats Range on Joint Base Elmendorf-Richardson because this area provides benefit to beluga whales under an existing Department of Defense Integrated Natural Resource Management Plan. The Fisheries Service said the critical habitat designation is based on the results of more than 20 years of research, and an economic analysis on the critical habitat designation which found that benefits of the designation to beluga whales exceeded the costs. The critical habitat final rule was developed after a public input process which included an initial 60-day comment period on the proposed rule, which was extended an additional 30 days. Four public hearings were also held. As a result of the public hearings and open comment periods, more than 135,000 individual submissions were received. The agency considered all public comments in developing the final rule, and provided responses to all significant issues raised by respondents. This rule will become effective 30 days after date of publication in the Federal Register. Click here for the final rule, maps, status reviews, and other materials.